Sometimes you have to be personal. An artefact of media, even a thing seen by millions of people, can have that same personal effect, since when we write about media, we are not writing about the media in question, not really, nor are we writing about ourselves. We're writing about the intersection of the two. So if this is going to be an awkward piece, small in scope, I hope you'll forgive me. It comes from a time I have difficulty talking about in any sort of dispassionate way. 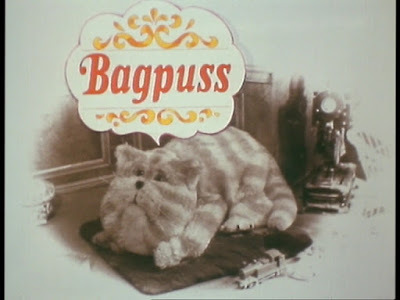 I was told that when I was little, Bagpuss caused me distress. I used to become anxious when Bagpuss awoke, and I would cry when Bagpuss went to sleep, for when Bagpuss when to sleep, all his friends went to sleep: the mice were ornaments on the Mouse Organ; Gabriel and Madeleine were just dolls; Professor Yaffle was a carved wooden bookend in the shape of a woodpecker; and Bagpuss himself, once he was asleep, was just an old cloth cat, saggy and loose at the seams. But Emily loved him. I didn't mean to recite the whole thing there. But I'm of the age. I can't remember who I am supposed to be meeting for coffee tomorrow, but I can recite the opening and closing monologues of Bagpuss with as much facility as I can repeat the Our Father and the Hail Mary, and what does that say about me? Even now the simple plucked strings of that gentle theme have an odd affect, a definite effect on someone like me. It was already awash with nostalgia when it was made, an ersatz home-made version of an Edwardian fantasy, set in an idealised version of a time roughly parallel to my grandparents’ childhood, without the poverty and the misery and abuse they suffered and learned to inflict on each other. Bagpuss came from the time that television realised you could make a comforting myth from a period that was still in living memory and that you'd be safe doing so, and in fact that the people who'd suffered the most would be the most enthusiastic supporters of your myth. I was talking with a friend a few days before writing this about how hard, mean-spirited young people grow into sentimental old people, how you can meet the sweetest old person and know that this was once a brute, and how that isn't a contradiction, or even a bad thing. It's just the way of things. It's not a bad thing that Bagpuss does this. Bagpuss is about nostalgia after all; it's quite deliberate. Oliver Postgate and Peter Firmin, both ghosts to us now, created with Smallfilms, their perfectly named production company, a series of handcrafted animated children's programmes that charmed and haunted those of us who grew up watching television in the sixties, seventies and eighties. They were cheap, and so they were often repeated by the BBC. 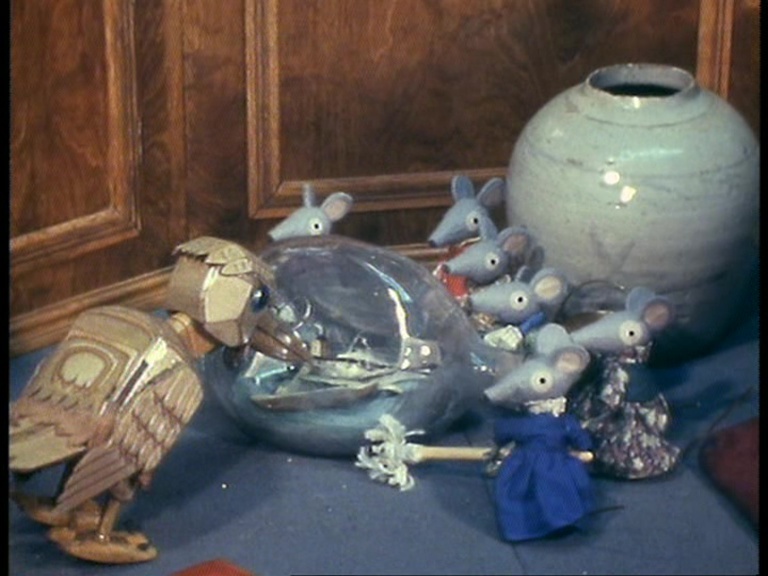 I don’t remember ever having watched The Clangers (1969-1974) or Noggin the Nog (1959-1965; 1979-80). Ivor the Engine (1959; 1975-1977) I had vague memories of seeing, but I didn’t pay much attention to it. 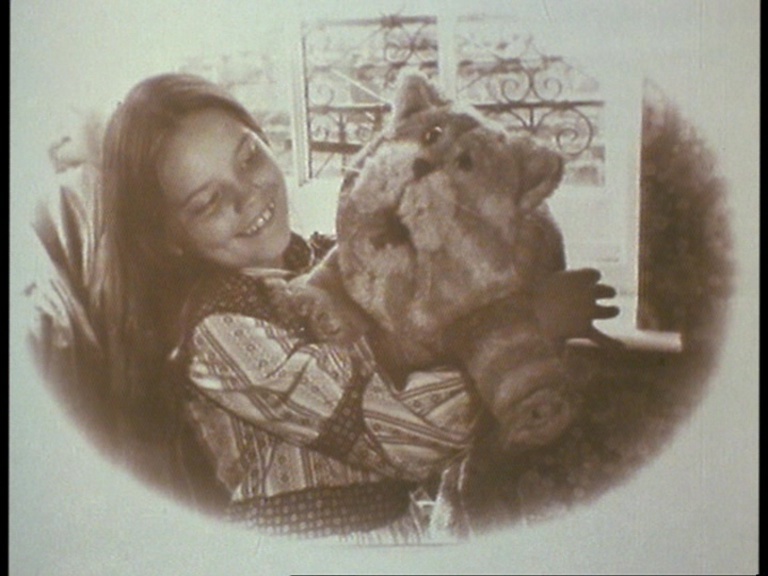 But I remember seeing Bagpuss several times over, and this isn’t a false memory – in fact, although only thirteen episodes of Bagpuss were made, it was broadcast at least for a few weeks every year from its first broadcast in 1974, right up to 1986. I haven’t mentioned all the Smallfilms productions I knew, of course. I need to address the subject of Tottie. Tottie: the Story of a Doll’s House (1984-86) affected me quite profoundly. I was a little older, still primary age, but old enough to recognise what was going on. Tottie was an adaptation of a book by Rumer Godden, and in Tottie, as in Bagpuss, dolls come alive, but here their lives are drenched in misery and anxiety, the sense that they are at the mercy of impersonal, distant powers (the children who play with them, as capricious as any pagan god). The misery expresses itself first in bullying, emotional abuse, gaslighting; and then in violence. The first series climaxes with a murder, in fact, as insecure, selfish china doll Marchpane contrives the destruction of poor, kind Birdie. Of course, the sight of poor celluloid Birdie consumed by flames would affect me deeply. I don’t think I’ve ever talked about Tottie before. I don’t think I’ll want to again. 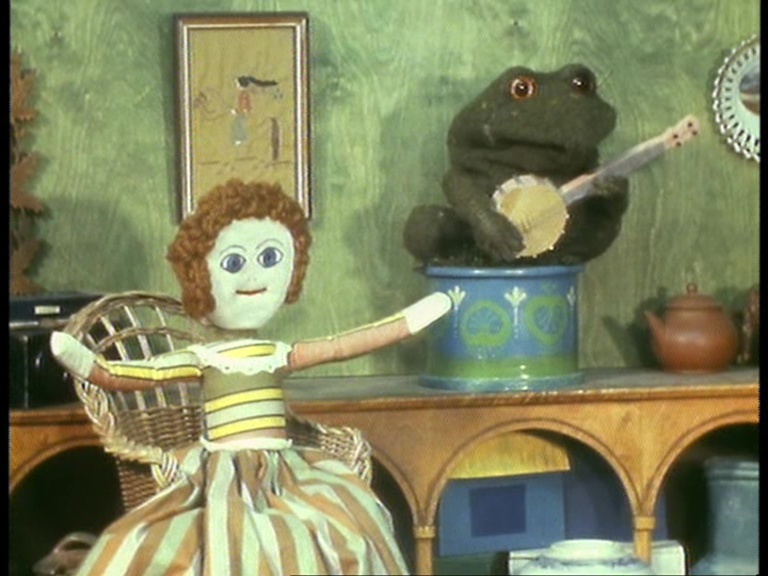 Bagpuss has a similar sort of homespun paganism to Tottie. Postgate’s voice, whimsical, wreathed in kindness, like the voice you always wished your grandfather should have had, tells us that once upon a time, not so very long ago, there was a little girl called Emily. We see her (in fact Emily Firmin, Peter Firmin’s daughter, not actually all that much older than me) in sepia. The photographs have that blur to them that in certain lights recalls the halo of a saint. Which Emily is, since she works a regular miracle. Emily finds a thing, usually a tatty, damaged, near-unrecognisable thing, and leaves it at the feet of the saggy old cloth cat, and chants her spell and leaves. The old items in the shop – the bookend, the ragdoll, the music box, the Mouse Organ – come to life, and they imagine what the object could be, and tell stories about it, and sing songs, and then they repair it, and leave it in the window for someone to retrieve. Charlie Mouse and the other denizens of the Marvellous! Mechanical! Mouse Organ! behave like children. They respond with whimsy, and humour, and mischief, and occasionally with fear. Professor Yaffle patronises and chides, but is very often entirely wrong, as the most patronising and professorial people tend to be. Madeleine is the encouraging parent, wise and gentle, and Gabriel is the fun uncle with the offbeat knowledge and the will to sing. And then there’s Bagpuss, gentle and retiring, a tutelary spirit, a grandad, indolent and expansive and accepting of all that comes before him. And it’s Bagpuss through whom life comes, and it’s Bagpuss whose yawn sends the others to sleep. They are here for him, and because of him. He is founder, high priest, summoned god of the antique shop. Bagpuss is the Benevolent Angel of Lost Things. Bagpuss is a pagan figure. Back in January 2018, I gave that talk at the Horse Hospital and I got carried away and went off on an entirely unplanned digression about how Bagpuss was totally folk horror, which was a thing I hadn't even considered before that moment (a friend told me much later that they hadn't realised it was extempore, but then my principle with talks is to assume no one cares about anything I'm saying, and that therefore nothing I say matters, which does wonders for your confidence, I can tell you). 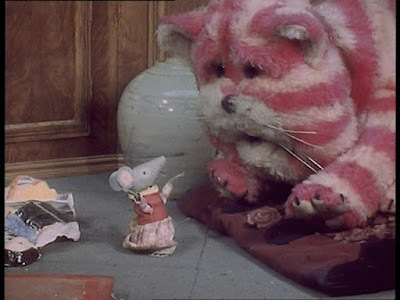 But Bagpuss, in a lot of ways, breaks folk horror, or at the very least serves as a corrective for it. It definitely shows both the strengths and limitations of Adam Scovell’s Folk Horror Chain: is there an isolated landscape? 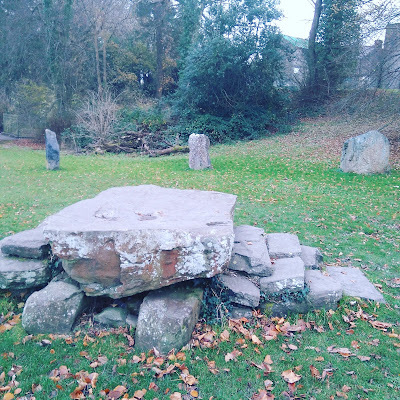 An odd paganism? A summoning? All of those things are present. But at the same time, that’s the principle under which you can have, oh, I don’t know, consecutive essays about Bagpuss and The Texas Chain Saw Massacre in the same series, and draw commonalities between the two. Bagpuss is a show for children about an adorable old cloth cat, who, with a bit of magic, finds stories in old things. It’s only folk horror in that it comes from the same place and time, the same root aesthetic, as stories about arts-and-crafts witches in lonely villages, about children bewitched by standing stones and ghostly stallions, as cerebral pieces about the decline of the rural countryside. In the end, it’s about a time and place, isn’t it? It’s about that last moment in history where even the science and the media were home-made, and the home-made and the haunted infiltrated into the mass media. Where, because the present was so very uncertain, the past was unresolved, and we were haunted by that past, aggressively. And on the one hand, that meant horror stories about backwoods people in America making household knickknacks from people's faces after getting laid off from the slaughterhouse, and on the other, that meant the inhabitants of a haunting piece of nostalgia for a world that never actually existed, repairing old things and finding stories in them. But that was the 70s, wasn’t it? Generation X was haunted. By the end of the 80s, everything was managed, polished, machined. But here, we had a thing that made a virtue of the homemade. That was about the lost things, the things that we too could make beautiful with a bit of craft and a bit of love. There was a point somewhere in my 20s, where I discovered that my efforts to mend and make were actually not inept anymore. As a kid, I didn’t have the skill and life experiences to make things beautiful. Now, I’m better at it. I can draw a bit, paint a bit, and I have the patience to finish a thing and make it beautiful, if only I have the time. And at the same time, I’m sort of aware that I’m probably halfway through my life, maybe more than that (the people in my family have a habit of not making it to 70) and I’m haunted by my unfinished projects. For me, as a child, Bagpuss was about a haunting. Now, as an adult, witnessing the working through of a second Haunted Generation, Bagpuss haunts me in a different way. 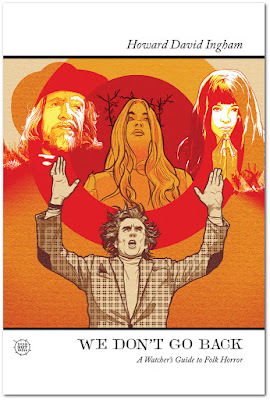 Wouldn't it be great if you could read more about folk horror and its cultural context? What about a big book all about folk horror movies and TV, you say? Well. 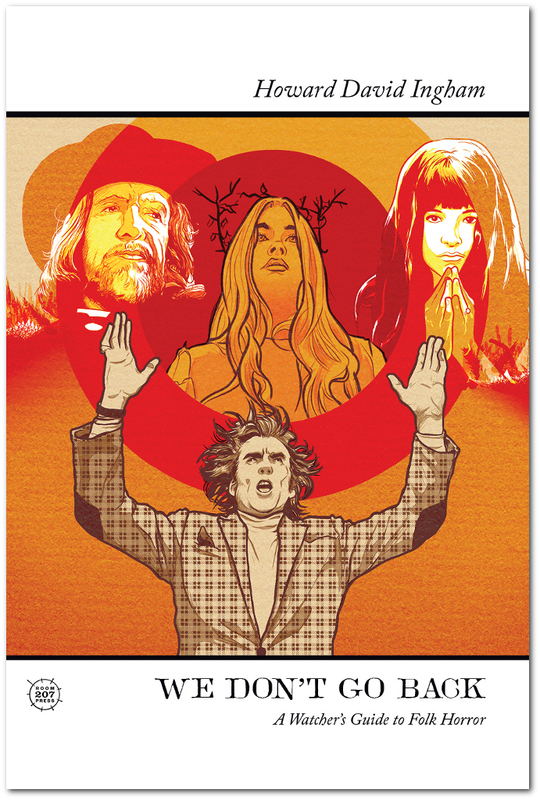 You'll probably be interested to know that We Don't Go Back: A Watcher's Guide to Folk Horror finally gets its general release on Friday. More news as and when, as they say. "12th of February, 1974, and for an audience of small children in the UK at 1:45pm, a life irrevocably coloured by the wayward wonderings of one saggy cloth cat. Some 44 years later and Earth Recordings opens the door to Bagpuss & Co. once again, revealing for the first time the original music in all its newly-mastered splendour. Released on limited edition 'Shop Window' sleeve LP, complete with 5 interchangeable lithograph prints, as well as 24 page Bookback CD. Illustration by Hannah Alice (www.hannahalice.co.uk). Both editions come with a download of all tracks. Contains new liner notes by Stewart Lee, Daniel Postgate, Frances McKee (The Vaselines), Andy Votel and Sarah Martin (Belle & Sebastian). And so their work was done."